For those who fear they may be bored to death with this blog entry, I'll sum it up in a nutshell so you save some time reading it if you just can't bear to continue. "There's so much more to H2O than you likely know." 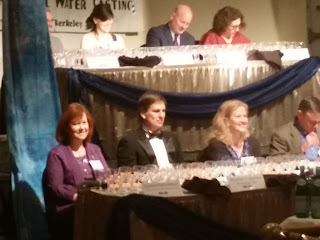 To start off, I will admit that I received quite the education when I was chosen to sit with a dozen or so of my colleagues to judge approximately 75 waters at the 27th Annual Berkeley Springs International Water Tasting in February. Each year, about a dozen judges are selected to spend a few days in Berkeley Springs, West Virginia to learn more about the nuances of water tasting and other important information about the role the life-sustaining liquid plays in the health of our planet. So how did I manage to nab a seat on the panel you might ask? 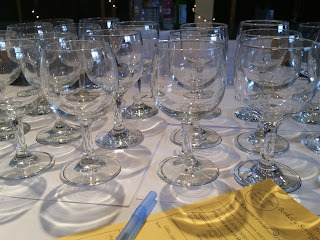 Well, it all began last year when I was put in touch with water sommelier Martin Riese for an upcoming article in the Chambersburg Public Opinion. 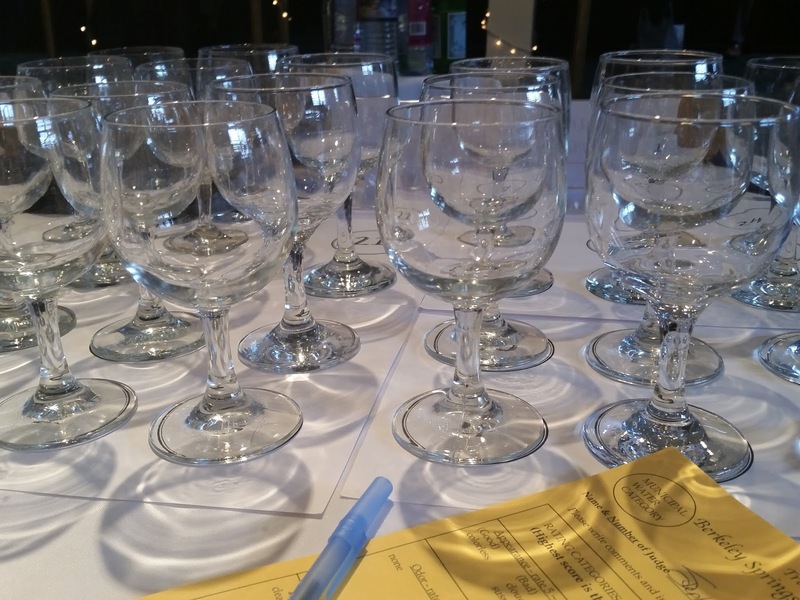 Suggesting that this country may be ready for more water sommeliers might likely earn one the accusation of being "all wet," but for Riese, it was, (and still is), serious business. Riese is known as the only water sommelier in the United States and has been featured widely in the media as such. The H2O expert is certified by the German Water Trade Association and at the time of the interview, had been hired by the Patina Group to create a 40-page water-tasting menu for Ray's and Stark Bar in Los Angeles. Last year, Riese participated in the water judging and granted me an interview, which, in turn, led me to event producer Jill Klein Rone. Jill learned about my blog and dining column and asked if I'd be willing to participate as a judge the following year. I was skeptical about my ability to distinguish one water from another, but am always up for a challenge, so I agreed and this February I joined other food writers, bloggers and various media personalities at the historic Country Inn of Berkeley Springs.There we spent hours sipping, scoring and comparing a variety of waters, evaluating them for clarity, taste, "mouth feel" and other attributes. A "common room" at the Country Inn of Berkeley Springs. The Morgan Tavern at the Inn at The Country Inn of Berkeley Springs. A view from the outside of the Country Inn of Berkeley Springs, which dates back to 1932. According to Klein Rone, the competition has grown exponentially over the years. "When the event started, it was to draw people to Berkeley Springs as part of a winter festival. We had no idea it would end up being so important in the water world." This year's theme was "Water: Beneath the Surface and Around the Globe" and water experts from around the world gathered to discuss such topics as the crisis in Flint, Michigan, infrastructure and protecting our water supply. One of my first jobs as a judge was to take part in an educational session delivered by Water Master Arthur Von Wiesenberger. Weisenberger, who grew up in Italy and describes himself as a "passionate hobbyist," flies in from Santa Barbara, California each year to share his knowledge with the panel. As a colorful personality and an endless "font" of information, he shares sometimes humorous stories, like the tale about a "rogue" judge who scored a rather odious municipal water quite high. "It reminds me of my childhood," declared the native Frenchman. During the session, Wiesenberger keyed us in on various aspects of water, from minerals, to trace elements and carbonation. "The most common tastes consumers experience in tap water come from chlorine, (from the chemicals used in water treatment), iron (from pipes, storage tanks and nature) and sulfur (usually from natural hot springs.)" He explained that bottled water has varying degrees of mineralization, which impart a range of flavor,"mouth feel" and "aftertaste sensations." The Water Master also provided us with a small compendium on the subject titled "The Taste of Water," which included a glossary of sometimes humorous tasting "notes" including "wet band-aid, wet dog, flabby and flinty." After the educational session, we began sampling some of the finest waters in the world, some coming from as far away as Greece, Norway, New Zealand and Korea. Von Wiesenberger cautioned us to be cognizant of the information he shared as we waded into the realm of the water critic.We spent the afternoon and evening examining the clarity of the water placed before us by holding wine glasses up to the light against the backdrop of stark white paper. We rolled the water around in our mouths to gauge "mouth feel" and scored the various entries according to a series of attributes, including how we felt about the taste--whether we were we "over the moon," or just "meh." To prevent palate fatigue we were supplied with an ample supply of the aptly named Carr's "water crackers," which we would nibble on here and there and then resume the process of tasting. We took several breaks for reasons you can probably guess and one final break for dinner where we socialized with our colleagues before reconvening. We tasted municipal water, purified and bottled water, both still and sparkling. Discerning degrees of difference between the various purified waters turned out to be the most challenging due to subtle nuances. The easiest waters to judge ended up being the municipal and the sparkling water, both of which had a stronger "taste." An interesting takeaway, in my opinion, is that there are far better sparkling water choices than salty Perrier. The challenge will be to find any of those brands in my town. To add to the complication, I have no idea which ones hit a home run with me since it was a "blind" competition, but now I will be actively seeking alternative brands. The view of the "tasting" from my vantage point, along with the score sheet. One interesting fact was that an unusually large percentage of left-handers were seated at the front table. That's me in the purple. The pricey Svalbardi Polar Iceberg Water from Norway. A few things that surprised me about the experience. Number 1: The event drew a large audience--in fact--quite a few people observed the competition and the crowd swelled during the evening events as they watched us....taste....water. Granted, I imagine a few were family and friends of those who entered their waters in the competition, but still...Who knew that water tasting would be a spectator sport? 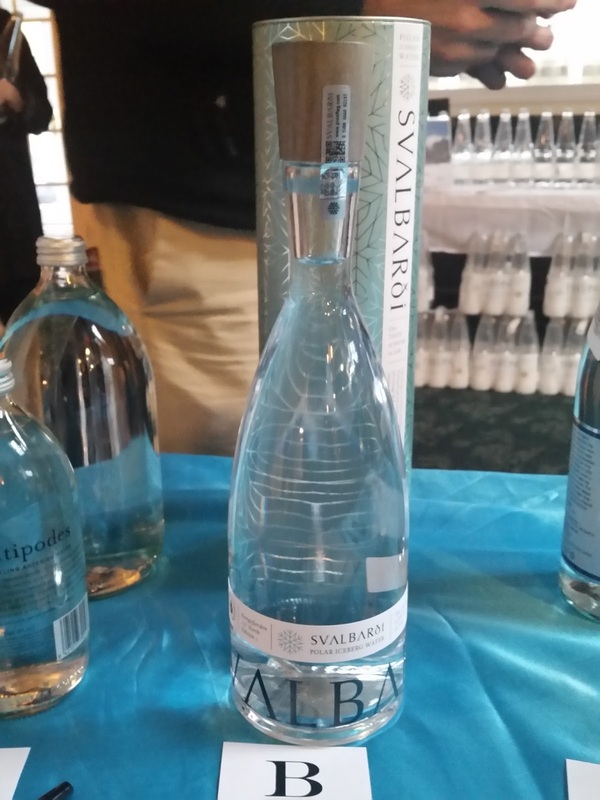 Number two was the cost of the Svalbardi Polar Iceberg Water from Norway. A display told the story of the niche water and how it makes its way to market. Harvesting glacier ice is no small feat, nor is it inexpensive.You can read more here. During the event, the public played an active role by casting its vote on the most attractive packaging. "Winners have experienced exponential growth, others have closed major deals and almost all winners redesign their labels to display their winning medal," said founder Jeanne Mozier. "The impact of winning this event is extraordinary for a bottler," she added. The competition culminated with a "water rush" where the crowd rushed the stage with all manner of bags and receptacles to grab as many bottles as they could carry. Even the kids got in on the action. I must say it was an interesting, fun, educational experience and I took time the day before to explore charming and historic Berkeley Springs, West Virginia, where I learned the story of the Berkeley Castle and laid eyes on what is rub-a-dub-dubbed as "George Washington's bathtub." I'll be blogging about my time there in the next week or so.